Lay out your personality on your patio: you can go with a California Casual look or have a South-Western 'frontier' motif or opt for a quaint Cape Cod number. AAP Construction will build a patio to suit any lifestyle! Patios can be constructed in different ways:– Inexpensive ready-made patio components are available. These require only assembly and fabrication to build a budget-friendly modern patio. On the other hand you can have a custom-designed patio that is built from scratch. You can use sawed stone, marble pavers, and fine hardwoods for a deluxe patio. We've been making patios since 1993 and are happy to put our experience at your disposal. Call AAP Construction now at (973) 298-1013 and we will provide a host of possibilities. Possibilities such as a floor-level or raised deck patio. 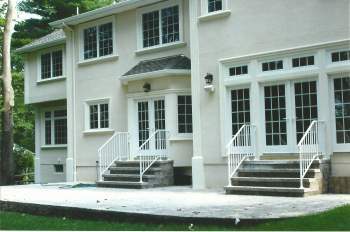 With or without a decorative railing. Uncovered, or covered with a retractable awning. And we'll also provide no-pressure, pocket-friendly quotes! The experience we have been acquiring since 1993 will come in useful for you as we will be able to provide options that others may not. For instance, your patio can be a separate, standalone exterior to your house, or it can actually be an extension of your dining room by way of a french window. If you want a stonework patio but are on a budget, AAP Construction will show you how a patio can be constructed of concrete but with a stone appearance and finish! In either case, if you want a 'package deal' that includes matching patio furniture, we've got you covered there too. Let AAP Construction help you express your personality through your patio. To know more and get no-strings quotes, call us today at (973) 298-1013.